Michael Sachs of the Berklee-Monterey Quintet by Mike Rainey This band plays straight-ahead classic jazz, the sort you&apos;d expect to hear in a smoky bar. All five members looked very serious, intense and focused - possibly so focused they didn&apos;t even notice how much the audience at the Monterey Jazz Festival was enjoying their music. 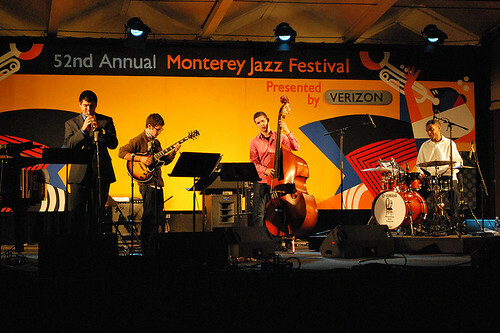 The Berklee-Monterey Quintet by Mike Rainey For all our coverage of the Monterey Jazz Festival, see our Monterey Jazz Festival category.